2018 witnessed a fundamental shift in how Ethiopia’s ruling party governs. How did it come about, what is incomplete about this transition, and what happens next. The youth protest movement that emerged in Ethiopia in 2016, forged a fundamental shift in power relations by 2018. Tech savvy youngsters in Ethiopia challenged prevailing social media theories by employing communication technologies for the mobilization of collective action. It was against the severely repressive political regime of the Ethiopian Peoples’ Revolutionary Democratic Front (EPRDF) (1991-present) that forms of clandestinely held protests began to emerge. Particularly pronounced in the region of Oromiya, its magnitude increased after October 2, 2016 when scores of people died at the annual Irreecha cultural festival. (Irrecha is an important cultural festival of the Oromo people. People gather each year in Bishoftu, 40km from Addis to celebrate the end of the rainy season and welcome the harvest season.) The festival followed a stampede triggered by security forces’ use of teargas and firearms. It was after this incident that young Oromo protesters began to attack business establishments by burning them to ground. Some were targeted enterprises that were owned by the state and some were multinational corporations. At first, the protests purposefully created an ethnic-based sentiment that exclusively attempted to address questions that pertained to the Oromo ethnic group (the largest ethnic constituency, followed by the Amhara). Young protesters called the kero, which disturbingly means young unmarried men, were social actors with an identity oriented viewpoint. Later in the movement, the protest encouraged other movements to emerge who apprehensively embraced the demands of the Oromo youth since the movement simultaneously opened a platform to echo their own injustices. For instance, diaspora social media outlets acted and interacted simultaneously with the kero movement, not only in the mobilization of protest actors but also in the production of political messages. However, the young Oromo protesters were by far more sophisticated and organized than the other movements that surfaced. The kero subsequently became the voice for justice not only for the Oromo ethnic group but also indirectly for other oppressions. Multiple voices of dissent—Amhara, Tigrean and Somali nationalists, among many, who had conflicting perceptions of nationalism and belonging—with multiple utopias, desires, belongings and identifications consequently emerged in social media channels. It remained unclear, however, how and to what extent the political subject maintained and strengthened its commitment to its form of protest. The inequalities, power relations, ethnic based relations in the process of subjection, required numerous interrogations. But at a volatile moment, these voices of dissent, each with their own history, context and specific intention ended up with general questions of political participation and representation. From a broader perspective, this movement impacted the transformation in politics, but the significance of these protests reside in the realization of social and democratic demands for each voice of protest in their own specific historical context. It is in this regard that questions about the outcome of these social media protests surfaced. Indeed, with no visible leadership, the kero used several strategies of protests and demanded response to core problems affecting the Oromo region, such as ethnic-based hierarchies, land rights, unemployment and corruption. Undeterred by the barrage of bullets fired at them, the protesters were persistently on the street, sometimes in groups and other times in spontaneous/simultaneous individual attacks on targeted establishments. Although methods of surveillance on internet and mobile communications were at their height, activists successfully circumvented the panopticon eye, though communication among protesters was mostly made through social media outlets. When excessive force by law enforcement became unbearable, they became deceptively quiet for a few days only to come back to the streets with entirely nuanced forms of resistance. As Hannah Arendt in her chapter on ideology and terror in The Origins of Totalitarianism states: “Under totalitarian conditions, fear probably is more widespread than ever before; but fear has lost its practical usefulness when actions guided by it can no longer help to avoid the dangers man fears.” Simply stated, the historical suppressed subject arose in a new social movement that was significantly different from previous social movements; fragmented, atomized with social actors rallied under identity oriented viewpoints but that ultimately served in amplifying larger oppressed voices. In the years that followed the end of state socialism, the EPRDF redefined the nature of politics with new economic, social and institutional agendas. Ideas that were caught somewhere between neo-liberal ideology and “revolutionary democracy” began to emerge in official discourse in the 1990s. And by the early to mid-2000s, the politics of the EPRDF had radically shifted. 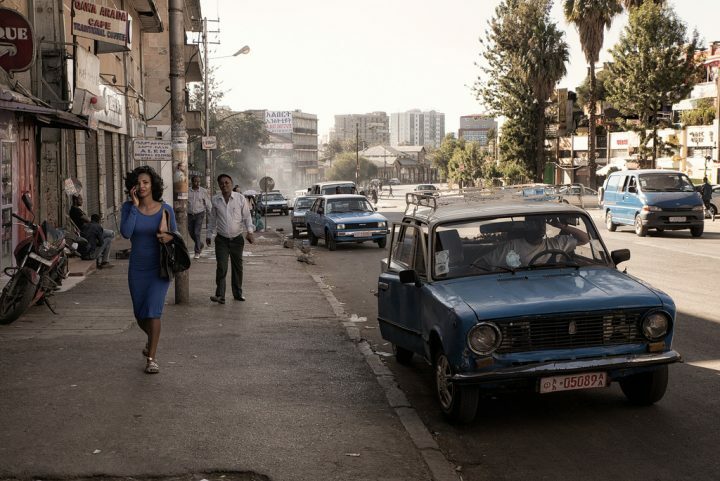 Increasingly drawn into post-Cold War global economic and political conditions, the “revolutionary democratic state” gradually changed to the “revolutionary developmental state.” In the absence of an economic model that clearly addressed Ethiopia’s economic relationship to global economic networks and powers, the mediation between leftist rhetoric and capitalist economic policies became disconcerting. Neither revolutionary nor democratic, the State imposed official narratives of progressive economic change over wide gaps in income; and this despite massive unemployment, repression of expression and obscene levels of corruption. Besides the edifices of politics and identity based on ethnic frameworks, the absence of a genuine multi-party democratic system also became cause for growing tensions. Most importantly, the glaring gaps in income, which were significant along ethnic lines, became cause for unrest. The intensified urbanization of Addis Ababa and its expansion to the hinterlands surrounding the city—land that is allotted to Oromo farmers under the federalist state—became the greatest site of contention since Oromo farmers were bought out with a meager sum to give way to corrupt investments. Certainly, impugning Oromo dignity, as a result of land grabbing, was the crucial dispute that the kero raised. But how the process of protest mobilization was managed, and how the social networks that set the general discourse of the protest were able to effectively communicate with participants in events/incidents is what is interesting, and what shaped and formed protest in contemporary Ethiopia. In this new understanding of social movement that brought about tremendous change—the resignation of Prime Minister Hailemariam Dessalegn and the appointment of Abiy Ahmed, an Oromo leader within the EPRDF, as the new Prime Minister—the multiple timelines of protest also defined the reach and immediacy of protest. Because traditional media was under state control, many Ethiopians and particularly the youth turned to online resources to follow the movement. Platforms like Facebook served as a space for alternative news sources and for social identification. They also served as a stage for the exchange of culture, such as music and literature that were produced under tyrannical conditions, and most of all, as media to express concerns around fairness and justice. Music and poetry, which particularly became prominent instruments of activism, were also followed by both Oromo and non-Oromo activists. Among the many Oromo artists to have played a role in recent events, notes law professor Awol Allo, “one musician and one performance stands out.” Allo refers to Haaccaaluu whose song Closer to Arat Kilo galvanized the movement. Haaccaaluu challenged the audience and the Oromo leadership in the gallery, which included Abiy Ahmed, who was then the deputy president of the Oromo Peoples Democratic Organization (OPDO) to make bold moves befitting of the Oromo public and its political posture. He urged his audience to look in the mirror, to focus on themselves, and decolonize their minds. We are, he said, closer to Arat Kilo, Ethiopia’s equivalent of Westminster, both by virtue of geography and demography. (…) The Oromo People’s Democratic Organization, the party in the ruling coalition that put Abiy forward, thankfully followed Haaccaaluu’s advice. After PM Desalegn announced his resignation, it fought tooth and nail to secure the position of the Prime Minister. After Abiy’s imminent confirmation, the first chapter of a journey for which Haaccaaluu has provided the soundtrack will be complete. Perhaps one can say it is one of the rare moments in modern Ethiopian history that music became an instrument for dissent. Indeed, Haaccaaluu’s music electrified the Oromo protest movement. On the other hand, the notion of the “we” in Haaccaaluu’s lyric such as “are we there yet?” or “have we arrived to Arat Kilo yet” made non-Oromo Ethiopians apprehensive. Who are the “we”? Was it only the Oromo ethnic group or did it include non-Oromo Ethiopians? Certainly for non-Oromo Ethiopians, Haaccaaluu’s music restricted the entrance to the gates of victory. But in an ironic way, since Haaccaaluu’s lyrics provided the broad political landscape of change in one of the rare moments that the history of resistance and exclusion was openly apprehended, his music, though shy from discussing the notion of the “we” also gained energy in non-Oromo social media circles. Activists chose conformist activism across conversations rather than unpacking the controversial features of ethnic-based politics. In this regard, while the informality and spontaneity of social media deliberations were fresh and innovative, discussions that surrounded the complexities of issues, such as the politics of ethnicity, were mostly reductive. It is with all these unresolved tensions that social media activism brought forth the contemporary state of Ethiopia. An essentialist perception of the social media political subject would be: it disrupted the status quo by playing an instrumental role in the resignation of a prime minister and the appointment of a young and seemingly progressive prime minister from within the same repressive party that is still in power. Shortly after assuming power, the new Prime Minister released hundreds of political prisoners, condemned the practice of torture (that had pervaded the country’s incarceration policy) and legitimized freedom of speech. To this end, the movement ultimately succeeded in becoming an overarching voice for justice. Yet without a collective political ideology and a coherent political voice, how do we constitute and unite the unresolved inventory of multiple micro utopias, desires, identifications and belongings? All the more striking is that activists claimed the internet as a neutral space in which everyone can uniformly network ignoring crucial issues that pertain to the political economy of the internet, and/or the dominant realities of capitalism and its relationship to the Ethiopian state and its economy. Besides understanding that Facebook and other social media networks are corporations and new arenas where capitalism can outstretch itself, it is also crucial to recognize the limitations of such kind of protest that arose and continue to exist without a materialistic analysis of the broader capitalist frame and its impact on the political projects of the state and on issues that the militant political subject sought to address. In an altogether complex way, such activism has presently resulted in the emergence of other political actors after Abiy Ahmed’s rise to power; a pluralistic public that has yet to employ the ideologies of a common cause. This lack of a common cause is dangerously reflected in present day persistent skirmishes among the pluralistic public. I believe we will better understand the compounded voices of protest if we think through new frameworks and alternative models that can open up productive ways for theorizing contemporary social movements. And I argue an important task is to identify the fundamental ways in which multiple levels of oppression are related to the political economy of class within the framework of late capitalism and its causal mechanisms. Perhaps we should bring back a counter ideology to capitalism into the studies of contemporary movements to re-theorize our fluid identities that are shaped by capitalism in multiple ways. Unfortunately, the new state is less concerned with the global capitalist dynamics and its political economic factors on dependent states. Within three months in power, the new prime minister has appropriated the voices of protest and is presently attempting to incorporate it to party line politics. He tells us liberalizing the economy would resolve our economic woes, a swift solution to youth unemployment whose economic disenfranchisement has supposedly galvanized restlessness. Furthermore, ethnic conflicts would be resolved through the spirit of “love.” Under great pressure from the IMF, stakes in state-held companies like Ethiopian Airlines are to be sold to private investors and industrial parks turned into sweatshops for H&M and other corporations (policies initiated by the previous prime minister) are to be expanded. The threat of authoritarian neo-liberal developmentalist projects and their uncompromising alteration of social structures will continue to flourish. In this regard, doubts remain as to the longer impact that these protests have made in achieving major political changes. Parts of this post were presented as a paper to the Winter School of the University of the Western Cape (UWC), South Africa in July 2018. What is this ‘New Uganda’?